Christmas quilt patterns provide you with a wonderful way to decorate your home or make quick and easy gifts for everyone on your list. Use these patterns to create beautiful Christmas quilts that are suitable for a beginner to quilting. Click on the pattern images as indicated to download the Adobe printable templates for each pattern. 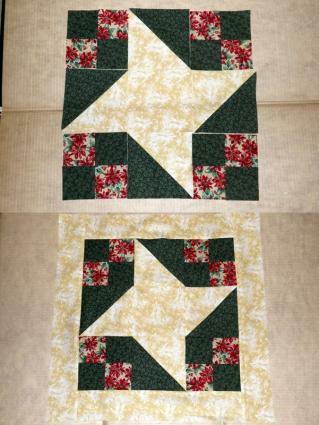 The friendship star is a favorite block among quilters. The star symbol and the Christmas colors chosen for the design of this wall hanging make it the perfect quilting project for adorning a wall in your home throughout the season. Choose 44"-45" wide, 100% cotton fabric. Do all piecing and assembly with right sides together, edges even and a 1/4" seam allowance. "In-the -ditch" means to stitch directly on the stitched seam between two pieced pieces. No special purchased binding is required. Binding is done by folding the backing to the front. The seam allowance should be consistent throughout the project, but individual quilters may have differing results within a fraction of an inch or two, that could add up when measuring the size of the finished piece. This is not a size-to-fit project so measurable differences in your quilt and the stated finished size will not be a problem. Cut one 3 1/2" x 29" strip from red fabric and one 3 1/2" x 29" strip from green fabric. Place the strips together with long edges even. Sew along one long edge. Open the strip and press the seam open. You now have a 6 1/2" x 29" two-color strip. Cutting across the strip, cut eight 3 1/2" x 6 1/2" pieces. Each piece will include one square of each color. Arrange two pieces into a 4-patch square. Matching the seams, sew the pieces together. Press the seams open. Repeat with the remaining pieces three more times. Using the printed 6 7/8" pattern square, trace and cut two squares from yellow fabric and two from green fabric. 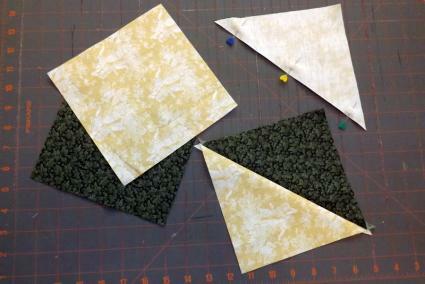 Cut each square in half diagonally to make four triangles from each color fabric. See the template square for clarification. Place one of each color triangle together with edges even. Sew the triangles together along the diagonal cut. Open the square and press the seam open. Trim the extending points even with the square edges. Repeat with the remaining triangles three more times. 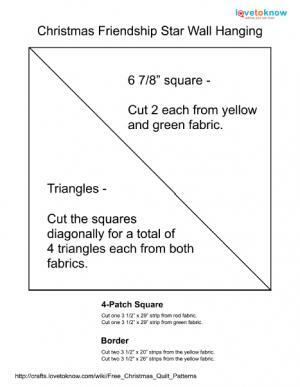 Using the printed 6 1/2" pattern square, trace and cut one square from the yellow fabric. This is the center square. Refer to the placement photo for the position of each square. Sew the squares together in horizontal rows, then sew the rows together. Press the seams open and trim the edges even. Note: The 4-patch squares are rotated so that the same color patch is inserted into each outer corner. The triangle squares are also rotated to angle the star points toward each side edge of the quilt. For the border, cut two 3 1/2" x 20" strips and two 3 1/2" x 26" strips from the yellow fabric. Determine which edges will be the top and bottom of your wall hanging. Align the edges of the wall hanging and the 20" strips together. Sew the strips to these edges. Press the seams open. Trim the ends even with the wall hanging edge. Align the edges of the 26" strips on the remaining edges of the wall hanging. Press the seams open and trim the ends. Lay quilt batting on your work surface and smooth out any wrinkles with your hands. Apply quilter's basting spray to the back of your finished quilt top. Place the quilt top on the batting with the right side facing up. Smooth the quilt top over the batting using your hands. Trim the batting even with the quilt top. 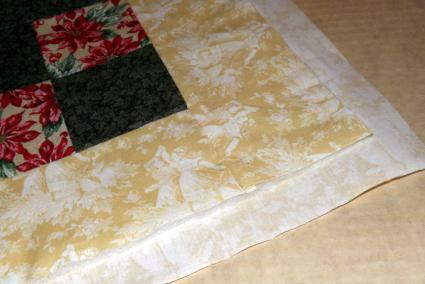 For the backing, cut a square from the yellow fabric one inch larger on all sides than the quilt top. Lay with the wrong side facing up. Smooth flat with your hands. Turn the quilt top over with the batting side up. Apply quilter's basting spray to the batting. Center the quilt top on the backing with the quilt top facing up. Re-position, if necessary, to ensure an even amount is extending from each edge. Turn the quilt over. Smooth the backing over the batting with your hands. 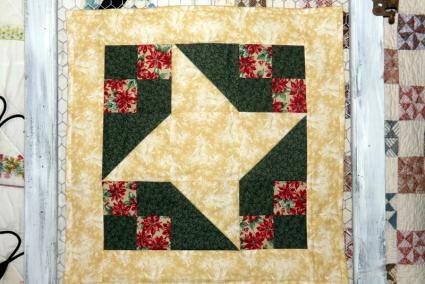 Quilt in-the-ditch on each outer seam of the star. Quilt in-the-ditch on the inside edge of the border all the way around the quilt. Fold and press 1/2 inch toward the front on the outer edge of the backing. Fold again over the edge of the quilt top and pin. Miter fold the corners. Top stitch along the pinned edge to bind the quilt. Hand sew a one-inch plastic ring to the back of each corner of the quilt for hanging. This runner was designed with four appliqued blocks. To lengthen or shorten the runner, add or subtract blocks and adjust border, backing and batting measurements. Finished Size: 12 1/2" x 44"
As with the wall hanging quilt project, keep the seam allowance consistent while completing this quilt. Your completed size results may differ slightly because of seam allowances, but this won't affect the appeal of the finished piece. Cut four 9 1/2" squares from muslin. 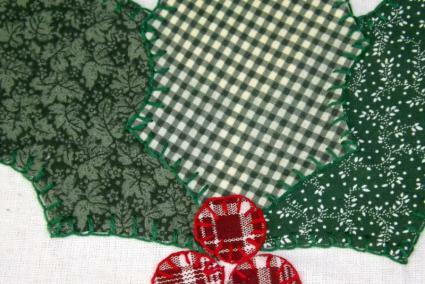 Using the printed pattern, trace 12 holly leaves on the paper side of lightweight fusible web. Rough-cut around the leaves. Iron the traced leaves to the back of an assortment of green cotton fabric scraps. Cut out the leaves. Repeat this step using the berry pattern and a red fabric scrap to make 12 berries. Cut and place leaves and berries. 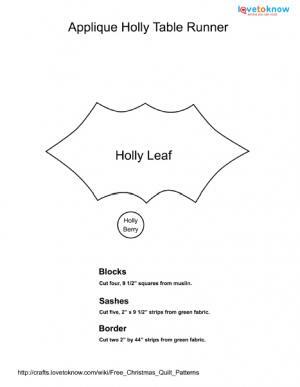 Peel the paper backing from each fused holly leaf and berry. Refer to the placement photo for the position of the leaves and berries on the muslin blocks. Iron the leaves and berries to fuse them to the blocks. Using three strands of green embroidery floss, blanket stitch around the edges of each leaf. Repeat using red floss around each berry. Lay the blocks in a vertical row. Alternately position each block with berries to the right and then the left. Place a 9 1/2" sash at the top and bottom of the row, as well as between each block. Sew the sashes to the blocks. Press the seams open. Trim the edges. 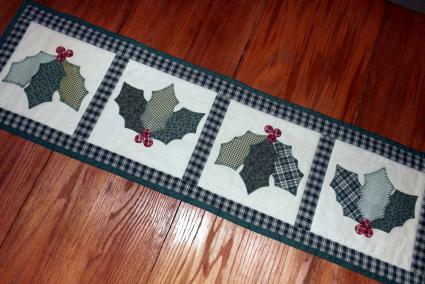 For the long outer border, cut two, 2" x 44" strips from green fabric. Attach to the long edges of the runner. Press the seams open. Trim the edges. Lay quilt batting on your work surface and smooth out any wrinkles with your hands. Apply quilter's basting spray to the back of your finished runner top. Place the runner top on the batting with the right side facing up. Smooth the top over the batting using your hands. Trim the batting even with the runner top. For the backing, cut a rectangle from green fabric, one inch larger on all sides than the runner top. Lay with the wrong side facing up. Smooth flat with your hands. Turn the runner top over with the batting side up. Apply quilter's basting spray to the batting. Center the runner top on the backing with the top facing up. Re-position, if necessary, to ensure an even amount is extending from each edge. Turn the runner over. Smooth the backing over the batting with your hands. Quilt in-the-ditch between the borders and the blocks. 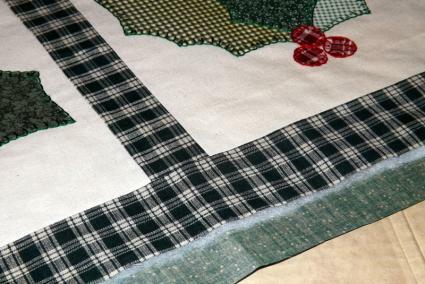 Quilt in-the-ditch between the inside edge of the border all the way around the runner. Fold and press 1/2 inch toward the front on the outer edge of the backing. Fold again over the edge of the runner top and pin. Miter fold the corners. Top stitch along the pinned edge to bind the runner. 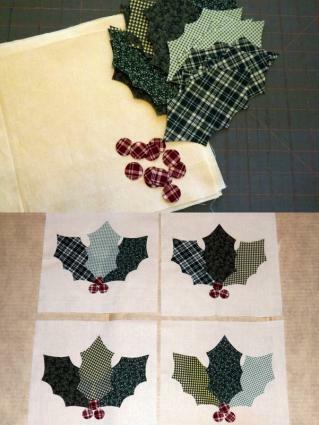 Old clothing or non-seasonal fabric scraps can easily be used for creating these Christmas quilts. These quilts both use a binding made from the backing folded over the edge. If a pre-made bias binding is desired, cut the backing even with the front and batting before applying. The quilting for these projects was done using a sewing machine. Hand quilting is also an option if you prefer it. 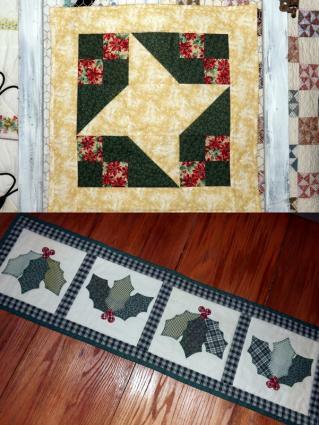 If more quilting is desired, quilt 1/4 inch inside the outline of the star on the wall hanging, or 1/4 inch outside the leaf and berry arrangements on the runner. The backing on either project can be pieced to size. Many sewing and quilting sites offer even more free quilting patterns for a variety of skill levels. 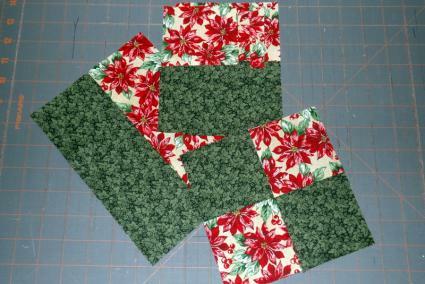 Here are a few more Christmas quilt patterns to inspire you. The Quilting Company offers a free ebook filled with Christmas patterns you can easily download. This glorious angel at Crafty College is surrounded by log cabin blocks. It would be fun to sew and to give as a gift, but it does require a quilter with intermediate to advanced skills and a sewing machine that can perform applique stitches. The easy Christmas Packages quilt on Moda Bake Shop was designed and made by a 17-year-old boy. Moda Bake Shop is a quaint site set up like a bakery. If the sweet-treat terms for fabric sizes throw you, check out their Weights and Measurements page for equivalent measures. If your holiday season seems to be running out of control, Stitching and Bacon has quilted tree trivets that can be completed in 20 minutes. Make them for yourself, as gifts, or as a beginner project for a new sewer. Many aspects of a quilting project can be done during long car trips or while waiting to pick up kids from school activities. Keep a bag of applique or hand-quilting supplies available for just these occasions so you'll always have time to work on your quilted holiday gifts and decor items.